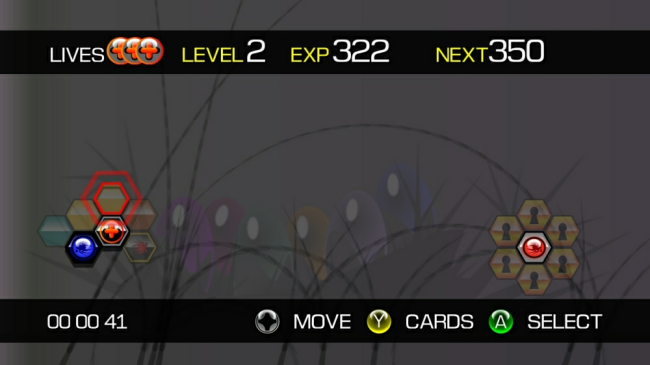 To balance this, you are able to play various cards that you collect during play at the map screen before entering a stage. Effects such as shields taking 3 or 5 hits (at the cost of being a larger target), assist drones and more are available. Like most danmaku shmups, your hitbox is rather small compared to the rest of the ship, made obvious by small, blue mass in the center. 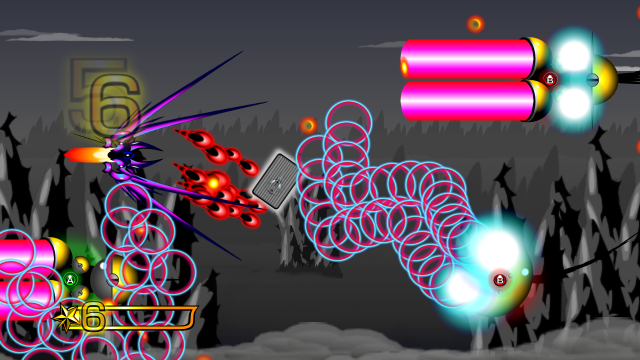 While the idea of color coded enemies of previous titles like Radiant Silvergun and Ikaruga are not new, the unique aspect of how Birth Order applies the concept is. Each face button on the 360 pad fires shots that automatically home into and destroys the appropriate enemy (ex. 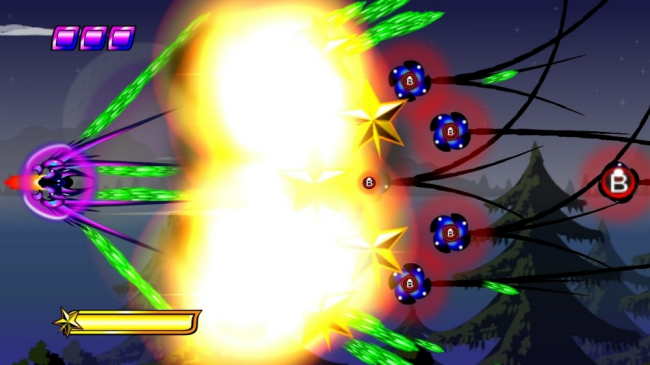 A fires green shots to destroy green enemies, also indicated by the button on screen), leaving you to focus on dodging and collecting cards. Also note that only collision with bullets, not enemies, will kill. Taking another page from shumps like Mushihime-sama, destroying enemies also clears whatever bullets they fired into stars that automatically gather to your ship to level up with the exception of orange-yellow shots. Larger stars and cards are also dropped. The unusual thing about Birth Order is that your ship is much larger with its spines protruding outward than it should be for no real reason. While being aware of the hitbox and chaos that ensues from the blanket of bullets, it can be a bother at times. The enemy variety is also not that impressive as most tend to repeat alongside the stages. Really, most everything about Birth Order, other than the gameplay, is quite subdued. Music is somewhat unmemorable and ends up either drowned out by the rest of the sound effects or not so audible. The few stages that you see throughout are barren and due to the map structure of the game, they tend to repeat often. It is clear that Birth Order is meant to be played for the mechanics and challenge, not for aesthetics and style. Your ship is the most distinguishable object in play with its rather large body and several spines protruding outward in an obtrusive manner while the targets seem like geometrical shapes. Call it abstract, perhaps, but maybe too abstract for its own good or simply 'just because' without any sense of purpose and meaning behind the method. While this would be an issue for most games, what makes up for this in Birth Order's favour is that the game is not very long to begin with as it can be beaten in one sitting. How long it takes for one to achieve that one sitting may depend on experience with shmups, even though Birth Order does throw some tricks to be something fresh from the usual. The 80 MSP price point compliments this further. The random factors like the map and cards that makes Birth Order a different experience with every play can keep things from being too predictable and can keep determined players coming back until it is finally vanquished. All in all, Birth Order is an interesting experiment with the typical shmup format that offers nice ideas in a very small and affordable package. While the presentation is lacking, whether by limitation or choice, there is a nice experience for those looking for a unique take on bullet dodging. Download the demo/buy the game here (from the XBOX Games Marketplace).